In this lesson, we will learn how to find an object's center of mass and to analyze the effect of the position of the center of mass on an object's stability. The object shown in the diagram has a uniform density. Which of the points 𝐴 , 𝐵 , 𝐶 , and 𝐷 is closest to the center of mass of the object? Which of the following statements most correctly defines the center of mass of an object? AAn object’s center of mass is the point from which the object’s weight acts. BAn object’s center of mass is the point at the center of the object. CAn object’s center of mass is the point in the object nearest to the ground. DAn object’s center of mass is the point in the object that has the greatest density. The skewed object shown in the diagram can be supported by one of the objects A, B, C, and D. Which of these objects would most stably support the skewed object? A, B, C, and D all have the same masses as each other and all produce the same amount of friction at their points of contact as each other. All the objects have the same uniform density. 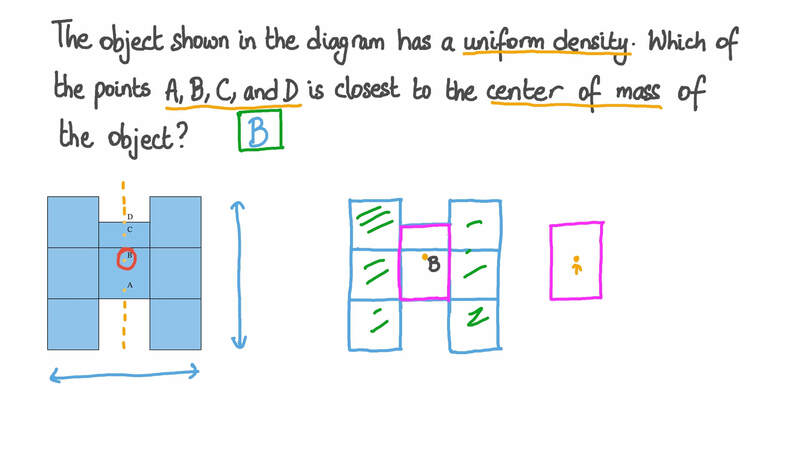 An object has uniform density. The object is shown in the diagram at rest on a horizontal surface, rotated to stand on different sides. Which of the orientations A, B, C, D, and E has the greatest horizontal distance between the object’s center of mass and the nearest point to the left of the center of mass at which no reaction force from the surface can act on the object? Which of the orientations A, B, C, D, and E has the least horizontal distance between the object’s center of mass and the nearest point to the left of the center of mass at which no reaction force from the surface can act on the object? In which of the orientations A, B, C, D, and E would a leftward horizontal force applied to the top of the object, as shown in the diagram, most easily result in the object tipping over and coming to rest in a different orientation? Assume that the friction between the shape and the surface is the same for all orientations. The object shown in the diagram consists of two parts. Each part has a uniform density, but the density of the smaller part is twice that of the larger part. Which of the points 𝐴 , 𝐵 , 𝐶 , and 𝐷 is closest to the center of mass of the object? Which of the points 𝐴 , 𝐵 , 𝐶 , and 𝐷 is the closest to the center of mass of the object shown? The object has uniform density.